The seventh workshop was held on the 26th of May 2018. It was with students from “St. Paisii Hilendarski” Secondary School – 3rd ”g” grade, because a child with Down syndrome is being taught in this class. The main aim of the integration of children with special educational needs is to involve them adequately and to the optimum extent into their peer environment and subsequently in the society as a whole. Mrs. Grudeva presented the project to the participants, introducing the goals and the tasks. We started with a warm up and preparatory exercises for the Dodgeball game. We have chosen this game because it is rhythmic and it has a lot of motor activity. We divided the class into two teams and we appointed consuls, one of whom was the disabled student. Including him, we had to take into consideration his position towards the surrounding students and we reckoned that exactly with this position we could help him with the orientation. We watched how the student in two or three attempts began to pass the ball successfully and we immediately changed his position into a striker. The student was also doing it well at this position. He was obviously pleased with himself when he succeeded in helping his team. The sense of physical excellence helped him to be at the center of the field, thus enhancing the sense of his own dignity, which helped him in the other classes too. The workshop lasted 30 minutes. working to reach the state educational standards. 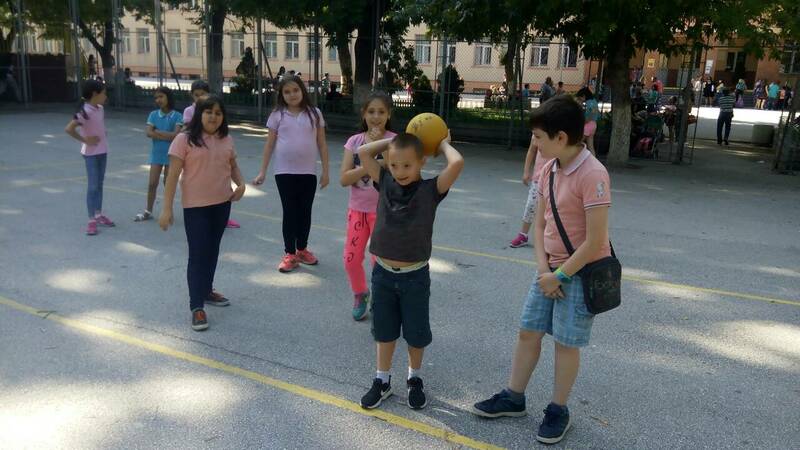 The workshop was organized by Mrs. Nina Grudeva and Mrs. Silva Ikimova as the seventh workshop within the scope of the project aiming to raise the students’ awareness of the benefits of practicing various sports.